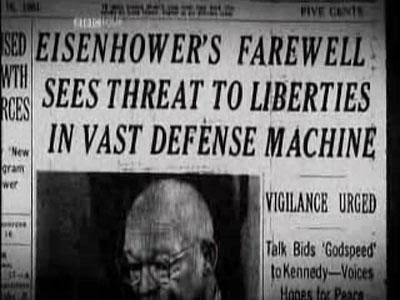 Long before the term 'Deep State' became popular, the term “Military Industrial Complex” was coined by President Dwight Eisenhower. His warning though proven correct, was sadly not heeded. Within a few years JFK was assassinated shortly after giving his “Secret government speech” warning the American people about “secret governments and secret organizations that sought to have undue control of the government. JFK was in his grave for less than 9-months before Gulf of Tonkin incident which was a series of outlandish lies about a fictitious attack on a US naval ship that never happened, which caused the US to enter the Vietnam war. President Johnson lied his way into a war with North Vietnam and within less than a year would joke that “maybe the attack never happened”. By the time the war ended in 1973, Johnson’s bundle of lies had killed 2.45 million people. The MIC however, saw the Vietnam war as a great victory and a template for the future success to their objectives. Ever since the Vietnam War, the MIC has urged the government to enter into as many ambiguous and unwinnable wars as possible, since unwinnable wars are also never-ending. Never-ending wars equate to never-ending revenue streams for the war industry. Eisenhower warned us about the concept of one particular industry taking control of our government, but sadly his predictions fell of deaf ears. Since Eisenhower’s time several other over "Industrial Complexes" have followed the MIC example and taken control of our government to suit their needs as well. Their objective is to buy out politicians in order to control the purse strings of Congress and they have been highly successful. The prescription drug industry has massive control of our government and our health care system. A recent Mayo Clinic study concluded that 70% of Americans are on at least one prescription drug. The most tragic example is opioids, though similar arguments can also be made in reference to the anti-depressant epidemic, obesity, heart disease and diabetes. The sicker America is, the better it is for the DIC. The drug lobby is 8x larger than the gun lobby and is indirectly responsible for the deaths of between 59.000 and 65,000 people in 2016 alone, but if we dig deeper, that number could easily be 2 or 3 times higher, Since deaths related to opioids from infection related to opioid related infections are extremely common Anti-depressants are being prescribed 400% more than they were in the 1990’s. They are commonly prescribed to adolescent women and we live up to the name “Prozac Nation” when we realize that 1 in 5 women between the ages of 40 and 59 are taking antidepressants. The list of other prescription medicines to enhance the DIC revenue streams is extensive. Firstly, no curing is allowed, ever. Treatment of conditions with temporary benefits is allowed, but healing is not permissible, since it interrupts revenue streams. And second, any and all “natural” or homeopathic treatment whether it be related to diet, supplements vitamins, anti-oxidants or physical exercise/meditation should all be relegated to “quackery.” Doctors who do not adhere to the prescription drug method of treating patients should also be referred to as adherents to “quackery” and should be reprimanded, fined and in extreme cases have their medical licenses revoked. Goal: Keep housing prices rising as much as possible, year after year after year. How this is implemented: Endorse the borrowing of money to entice people into buying excessively large homes in order to promote the “dream” of home ownership. Once people buy into this scheme, they are then saddled with massive home taxes to their city and the burden of the taxes utilities that go along with owning an excessively large home. Stigmatize anyone who is over the age of 25 and lives in the same domicile as a parent or grandparent. Make sure all media channels repeat over and over incessantly that high real estate prices are “signs of a great economy," while ignoring the crippling effect high home prices have on working class families who can barely pay their mortgage. The average tuition in 1971-1972 was $1832.00 and now it is officially over $31,000.00. There are over 60 colleges and universities where the tuition has already exceeded $60,000.00 per/year. A college education used to be something that people saved and paid cash for, but now there has been a cultural shift where students are expected to take out loans that are often in the hundreds of thousands of dollars to obtain a college degree. Why is this all so expensive? When we look at our universities and colleges, we see an obsession with elaborate new buildings and sports stadiums, more than actual learning. There are several emerging/innovative ideas to make a college education better, faster and far more affordable. Such concepts probably won’t take hold until the inevitable collapse of the entire educational system takes place. Much of the US healthcare system is now governed by the “Healthcare Affordability Act” passed by the Obama administration in 2010. The HIC proved how powerful they were when Congress was not allowed to read the legislation before voting for it, publicly displaying that the HIC who wrote the bill behind closed doors is more powerful than Congress itself. What transparent public committees were behind this important legislation? Our elected officials were not allowed to read the most important legislation of the past 30 years before voting for or against it. There is no greater testimony to the level of dysfunction in Congress than the Healthcare Affordability Act, formed by secret committees and then not allowing Congress to read it before voting. Let’s think back to 1961 when Eisenhower warned us about what would become the Vietnam War. The American people’s ignoring his warning caused arms manufacturers and big business to assume nearly complete control of US government. If we had listened to Ike, millions of people would not have died in the wars of the last 57 years and we would have trillions of dollars less in debt. Perhaps we still have time to heed his warning before our entire country collapses under the weight of corruption, crippling debt and never-ending wars, let’s hope so. Kevin Paul is the founder of Alternativemediahub.com, which refers to itself as “The megaphone of independent journalism.” Born in MA, he came within 2% of winning the R party nomination to oppose Ted Kennedy in 2006 and holds degrees in business and political science.